I will admit my taste buds are not too familar with Indian cuisine beyond curry and samosas, so when you get invited to eat at the largest Indian Buffet & Restaurant in North America, of course my natural reaction was “Hell Yes!” That’s right folks, Tandoori Flame offers such a wide variety of delicious and exotic dishes that no other Indian restaurant in Canada or even our lovely neighbours down south can claim that they are literally the king of the jungle in sheer size and variety of Indian cuisine. Tandoori Flame offers over 150 delicacies spread over 14 000 square feet and with a capacity for more than 500 guests. Their first location opened up in Brampton, Ontario but now they have recently opened up their second location in Mississauga, Ontario as well. This grand buffet covers the largest tasting in Indian food where the choices just seem endless. 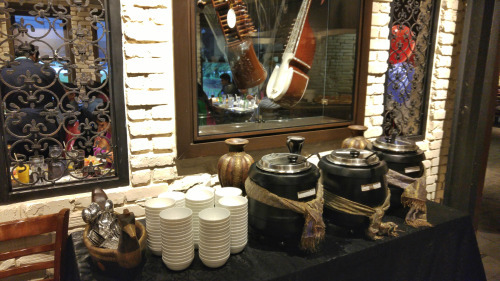 From Gol Gappas, Butter and Tandoori Chicken, Biryani, Samosas, Fala Fal, a significant variety of vegetable and non-vegetable Tandoori Kabobs, Tikkas and Curries, plus a huge dessert selection to finish it all off, Tandoori Flame is truly an all in one buffet. When I arrived at the restaurant, I was immediately in awe at how beautiful the decor and architecture looked outside and inside of the building. The entrance was extremely inviting with its outdoor lights all lit up that were hanging from its wooden walkway. Inside there are also many sculptures within the restaurant to really showcase its Indian hertigage, with other parts having a very rustic and even modern feel to it such as the white brick walls where my guest and I were seated for our dinner. It’s a great blend of traditional meets the modern age. Another observation of mine was just how clean this place was. You would think with so much food coming in and out of the buffet kitchen, the buffet tables or floors would be somewhat messy (and understandably so), but not here. Everything from the stainless steel counter tops to the floors were extremely well maintained and cleaned creating an even more enjoyable eating experience. With all that being said, lets take a visual look at what Tandoori Flame has to offer, their 150 Indian delicacies in all its glory. We have here some naan, butter chicken, tandoori chicken, samosas, chick peas, papadum, yogurt, rice. Here we have some jelabi, ice cream, mango pudding, gulab jamon, and waffle for dessert. 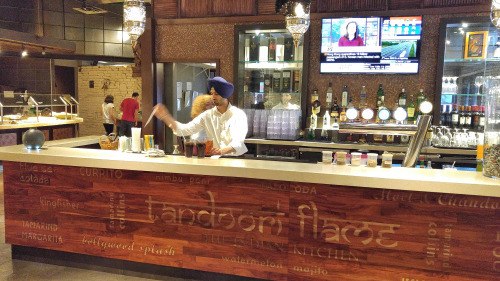 Tandoori Flame is a great introduction to Indian cuisine for anyone like myself who may be unfamiliar with the food as you instantly get exposed to so many different types of Indian delicacies all at once. 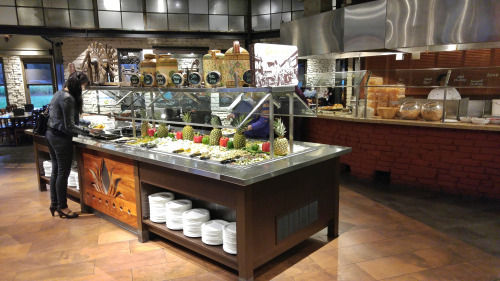 The fantastic thing about buffets is that you can try a little bit of everything. If you don’t like one aspect of the food, don’t eat it again. If you do like it, go all in and have as much as you like. The Mississauga location is also halal which is also a driving factor for many people who are on a more strict dietary regimen as Tandoori Flame caters perfectly for the more health conscious minds as well. 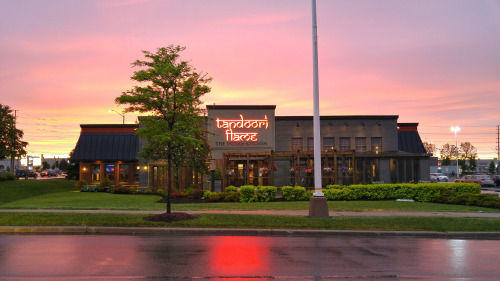 Tandoori Flame truly offers a grand buffet in pure, authentic Indian fashion. A restaurant perfect for all occasions!